Vicenza is located in Italy’s Veneto region, with a beautiful town center and viewpoints of the surrounding hills. We’ve chosen this area for 7 nights because from there, it is easy to visit the North of Italy on your own or by taking excursions to Venice, Mestre, Verona, Padova. Montecatini Terme is located in the Tuscany region and is the biggest spa-town in Italy. 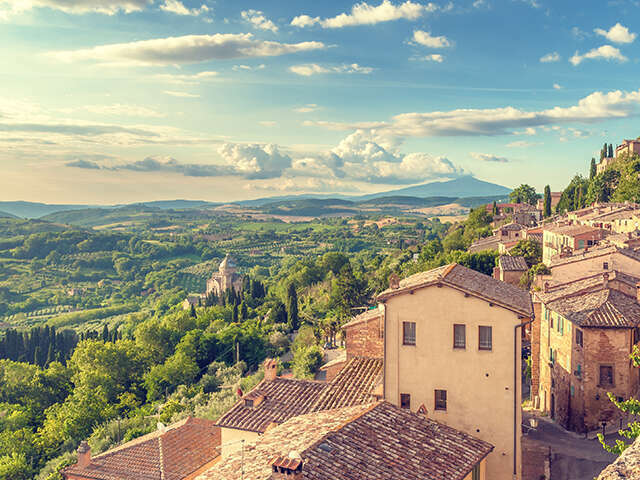 A 10- night stay is perfect for travelers who want to enjoy the town as well as taking short trips to nearby cities such as Lucca, Florence, Pisa, or Siena - all easily reached by bus or train. Rome, the Eternal City has so much to offer: monuments, museums, excursions to the north or south, the Vatican, the Coliseum, its food and great shopping. Enjoy 4 nights to experience the living history of this beautiful city. Book your Long Stay vacation with UNIGLOBE Travel today! Portugal, Spain, Italy, Greece, Croatia, Thailand, Bali, Australia and more. Conditions apply. Valid on travel booked through UNIGLOBE Travel. All advertised prices include or disclose taxes & fees. Prices and offers are valid for new bookings only. Air only prices are per person for return travel in economy class unless otherwise stated. Package, cruise, tour, rail and hotel prices are per person, based on double occupancy for total length of stay unless otherwise stated, and are applicable for the departure date listed at the advertising deadline. Pricing that includes airfare is valid only for the departure gateway listed. Airport transfers to/from the hotel may not be included and are supplier and destination specific. Some packaged travel products for certain destinations may include flight connections at an additional cost ($). Taxes & fees due during travel or in destination are additional and may include, but not limited to, local car rental charges & taxes, one-way car rental drop fees which are to be paid upon arrival, resort fees & charges, tour ‘kitty’ or local payment, airline baggage fees, departure taxes, and cruise gratuities. Prices are for select departure dates and are accurate and subject to availability at advertising deadline, errors and omissions excepted, and subject to change without notice by the supplier. Advertising deadline: Mar 13, 2019. For full terms & conditions please speak with a UNIGLOBE Travel consultant. Supplier Terms and conditions: Prices shown are per person, double occupancy, with flights on our group allotment. **Group seats have not been blocked for these gateways, price subject to change according to availability of flights and classes of service at time of reservation. *Passengers from our Edmonton will stay an extra night in Rome ( 5 nights total ) and return to Canada on Oct 24th, 2019. Prices were accurate at press time (Mar 13, 2019); they are applicable to new bookings – Quantity of seats and rooms are limited. Prices are subject to availability upon reservation. Not included: stay tax in Italy approx. 50 € in total, gratuity to drivers and guides, representatives, meals, beverage, optional excursions, travel insurance and all other item not mentioned. Seat selection is not permitted prior to departure on our Air Group Space. For full terms and conditions, visit www.exotikjourneys.com. Prices: per person in double occupancy, in a standard room, based on Oct 1 - Oct 23, 2019, air taxes included. Contact UNIGLOBE Travel for alternative departure dates or land only pricing.